React CRUD Example | MERN Stack Tutorial is today’s leading topic. This article’s goal is to explain the by making the CRUD application. Most applications are CRUD applications. If you don’t know what CRUD is, it’s short for Create, Read, Update and Delete. This application is also called a MERN Stack application because we are using MongoDB, Express, React, and Node.js tech stack. This article will show you the steps to create an app where the user can create new business, fetch that business, edit business and delete business using React.js. Let us understand the basics of React.js. 14 #9: Install Axios library and send a POST request. React.js allows you to express how your app should look at any given point in time. React will automatically manage all UI updates when your underlying data changes. When the data changes, React conceptually hits the “refresh” button and knows to only update the changed parts. The main reason to use React for your next project is following. Fast render with Virtual DOM. Redux: A State Management Library For Complex UIs. React Native: You can build a cross-platform native mobile application for Android or iOS. Aside from Facebook and Instagram, many well-known companies use React including Dropbox, PayPal, Netflix, Airbnb and many more. We will use the following Technologies with its version. 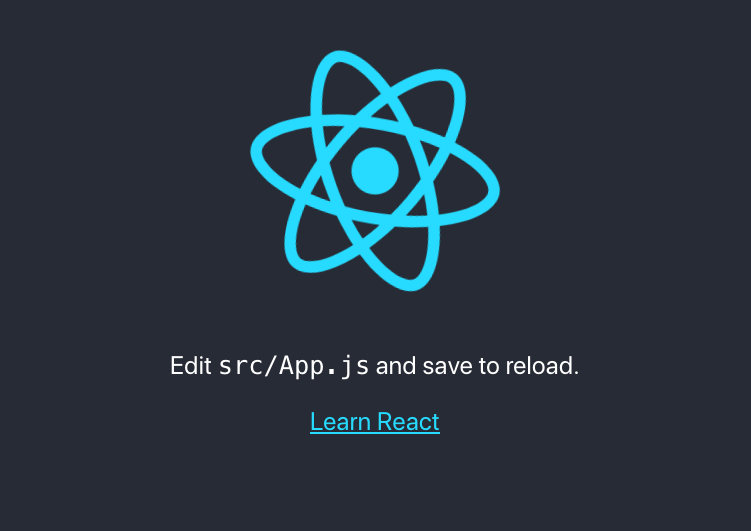 Create a new React app using the following command. If you are facing any issue on compiling then, please create a .env file on the root and add the following line of code. Now, install the Bootstrap 4 Framework using the following command. Import the Bootstrap CSS Framework inside our project. Modify the code inside the src >> App.js file. Save the file and go to the browser and you can see that we have successfully integrated bootstrap 4 in our react application. Type the following command to install the react- router-dom module. If you want to find more information about the react-router-dom module, then you can follow this documentation. Go to the index.js file and Wrap the BrowserRouter object around the App.js component. Inside the src folder, create one directory called components and inside that folder, make three components. Now, add the navigation bar in our React CRUD example. Write a following code inside the App.js file. Save the file and go to the browser. Write the code to generate the bootstrap form inside the create.component.js file. Okay, now we have three fields. So we need to create four functions that can track the values of the textbox and set that state according to it. Also, the fourth function will send the POST request to the node express server. Now, first, we will define the constructor and set the initial state and then also bind this to the different events inside the constructor. Then define the different functions with each input text values. So when the user types inside the textbox, we set the state according to it. So, let say, the user is typing the person name inside the textbox, we are changing the state value of person name. Finally, same for all of the inputs and when we submit the form, we get the values from the state and send to the POST request. Inside our reactcrud project root, create one folder called api and go inside that folder and initialize the package.json file. Also, install the nodemon as a development dependency. So that we do not need to restart every time, we change our server code. Now, inside the api folder, create one file called the server.js and add the following code inside it. Save the file and open a new tab terminal inside the api folder and hit the following command to spin up the node.js server. You can see inside the terminal that, our node.js server is running. If you are a beginner in MongoDB database, then please check out by below tutorial. I have already installed the MongoDB on Mac. So I am starting the MongoDB server by the following command. Inside the api folder, create one file called the DB.js and add the following line of code. In my local MongoDB database, the username and password are empty, but in the production, you need to create one admin user and assign the database to that user. 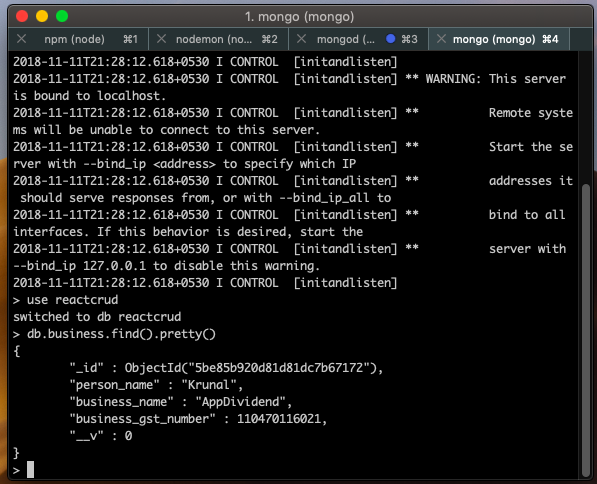 Save the file, and you can see inside the terminal that our node.js application is connected to a mongodb database. Next step is that we need to create a schema for the mongodb database. For that, create a file inside the api project root called business.model.js and add the following code. We have taken three fields called person_name, business_name, and business_gst_number with its datatypes. Write the CRUD code inside the business.route.js file. Here, we have defined the CRUD operations for MongoDB. So when the request hits the server, it maps the URI and according to URI, the above function will be executed, and database operation will be performed and send the response to the client. Here, we have used a Mongoose ORM to save, update, delete the data from the database. Mongoose is an ORM used in MongoDB database. Now, we have all the CRUD operations set up on the route file; we need to import inside the server.js file. Save the file and see the terminal and check if we got any errors. #9: Install Axios library and send a POST request. Install the Axios library and send the POST request. If you want to learn about the Axios library, then check out my Getting Started With Axios Promise Based HTTP Client Tutorial Example article. Now, send the HTTP POST request along with the form data to the node js server. We will send the data as an object because we have used the body-parser at the backend to pluck the data from the request and save it in the database. Write the following code inside the create.component.js file. Now, submit the form with proper values and open your browser console panel and see the response. Also, now check inside the mongodb database and see the values. To see the values inside the database, we can start a mongoshell and look at the values in the database. So, we can see that our data is added successfully. Write the following code inside the index.component.js file. So, here, we have sent the GET request to the node.js server and fetch that data from an API. We have imported the TableRow.js component. So let us create that component. Inside the components folder, create one more component called TableRow.js and add the following code inside it. This component is responsible for display the row data fetched from the backend. Save the file and go to the browser and see this URL: http://localhost:3000/index. First, add the Link to the TableRow.js file. Add the following code to the edit.component.js file. So, what we have done is, we have used the component lifecycle method to fetch the data from the API. That data needs to be displayed inside the textbox because this is edit form. Next, it is the same thing as we have written the code in the create.component.js file. Save the file and go to the edit page from the index or listing page. If the data is not displayed then please first check that you have the running node.js server on the backend. We have also written the code that will update the data because we have written the function that will send the request to the node.js server and update the data based on the ID. Now, the only thing remaining is to delete the data. So define the delete function inside TableRow.js file. 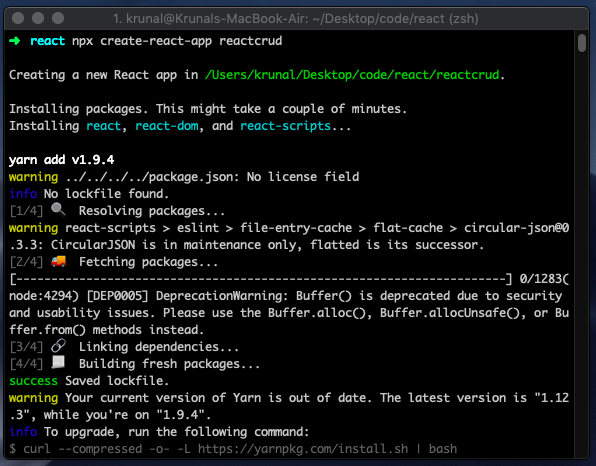 Now, we have completed React CRUD Example or MERN Stack Tutorial From Scratch. I have put this code on Github. So you can check that code as well. Finally, React CRUD Example Tutorial is over. Thanks for taking. Thank you, clear example and explanation! Is it clean to have a node_modules folder inside another folder? So after step #5 I have 2 node_modules folders in my project. I’m a beginner but it just doesn’t feel right or does it not matter? I’m still a beginner at this myself…but yes, there’s going to be *two* node_modules folders: one in the api directory and one in the parent directory. I’m a beginner too…but the project does require *two* node_modules folders: one for the React (front-end) app and one for the Express (back-end) app. You can help me about? Hello Kunal I am Bakorshisha, I have been following this tutorial and to be honest its really helpful, just wanted to ask a favor can you do a tutorial on how to add image in react using multer in the backend and also how to edit that image…. Please really greatful if you could help out here. Very good explanation, i did not find anywhere this kind of explanation. i hope you post a lot of blog like this. i can’t finding multiple insert implementation . any suggestion ? Hi! I’m working through this tutorial and it had been going well, but after step #9 the server is giving me the dreaded “cannot GET” response when I try to load the page. I’ve checked the GitHub repo, and my code is exactly the same in structure and content. Can anyone help me with this? Hi Krunal, Thanks for this great tutorial, I was able to complete this without any errors. When I am updating/deleting the records, the update and delete is happening fine, but in the index page, it still shows the previous state values, it is not updating the latest values, when I tried componentDidUpdate(), it is working but going in infinite loop, can you please help me in solving this issue? Hey Krunal. Thanks a lot for the tutorial. But i too also have the same problem. Everything works fine. But when update or delete is performed i am on Index page but i cant see updated data. I need to refresh the page. How to update the code. Could you provide the solution for this. First , Thanks for tutorial Krunal. Good job! Now , I make tutorial and I’m going to add for that refresh in real time when press input delete. thks… but where i put this code ? Why does state updating doesn’t work? You need to refresh page to refresh the state, it lost the point of react. Nope, it does lose the point of Single Page Application. In SPA, you do not need to refresh the page. You can see an example of PayPal. They also using React, Facebook, all apps are refreshing their pages. React is for building UI. Building a single page app is dependent upon us, not on the library. You Are Tony Stark On india (Iron Men). Great tutorial as always. God Bless you boy. Cheers!!! Hey Krunal, does your index page gets updated automatically after editing and updating the entries ? Because in my case i need to refresh the page to see the edited or updated values. Please revert back if possible. Great tutorial! When i click add Business, nothing seems to happen in the MongoDB. I manually added an entry into the DB, hoping to see it when I go to ‘index’ in the React App, however nothing shows up. Any idea where the issue may be? Looks like React isn’t connecting to Mongo correctly? Great Tutorial but I am stuck at step 9. I am not able to add to the db. It seems like http://localhost:4000/business/add is not reachable. Silly mistake. I had to open two terminals, one in api directory and one in root directory. 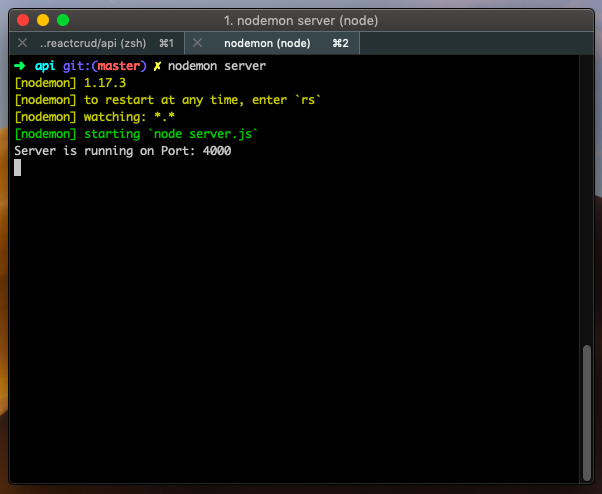 Run npm start on both the terminals and it works. Hope this helps. it just doesn’t work for me.i npm installed both api and react, as well as started them. i still get connection error. Add app.use(“/business”,businessRoute); line in server.js below app.use(bodyParser.json()); your prob will get resolve. Because business mapping is not done with routing file. If I manually add a table row into index.component.js the row displays correctly on an iPad. Any suggestions on what could be going wrong here? im already installed it, looks like i need to do something..